As the saying goes all models are wrong, some are merely useful. A map is simply an imperfect representation of the territory. This is actually essential for usefulness. A perfect map of France would be a 1:1 scale map at which point it is the size of France and in effect useless. All maps are approximations. 1) visual. It’s not a verbal story. 2) context specific. It is a map of specific landscape, it’s not a general map that applies to everything i.e. France is not the same as Spain. 3) position. You can see the position of relevant components (or features) on the map. This requires two things:- first, that you have components. Second, you have some form of anchor. Position is relative to something else and in the case of a geographical map then the anchor is the compass i.e. this hill (a component) is north of that feature. In the case of a game like Chess then the anchor is the chess board itself and a piece (a component) could be at position C1 or A2 etc. 4) movement. With a map you can see where components are moving (assuming they are capable of moving) and where they could move to i.e. the constraint of possibilities. Hence, I can see my infantry troops moving across the map and understand the barriers which force them to change direction i.e. troops walking off a cliff is not a good idea. 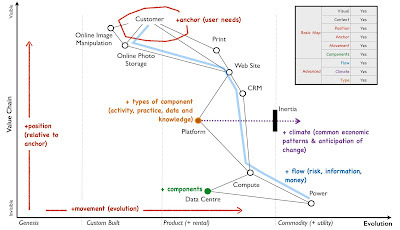 In business, you can use a Wardley map (these are provided as creative commons) to describe the landscape. It’s visual, it is context specific (i.e. 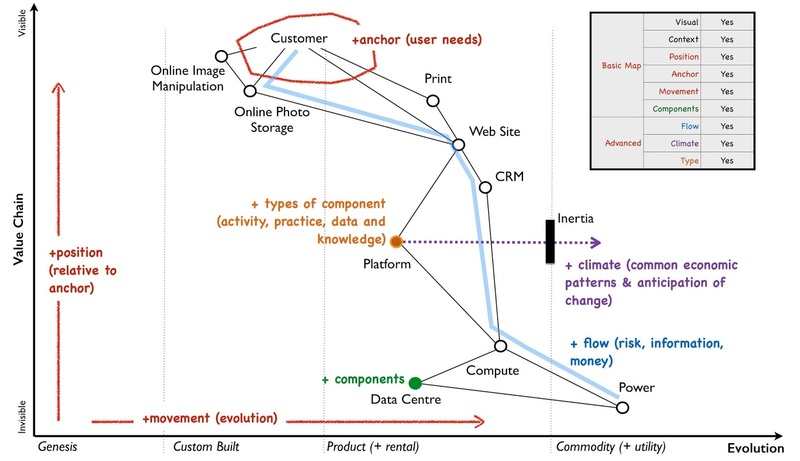 this business or that industry), it has position of components (on a value chain) relative to an anchor (the user need) and lastly you can see movement. I’ve provided an example below. It also has some advanced mapping characteristics e.g. flow, type and climatic patterns. Now, most companies use “maps” that aren’t maps i.e. they lack one of the basic characteristics e.g. business process maps, value stream maps, customer journey maps, mind maps … there’s a long list of things called maps which really aren’t. This doesn't mean they are not useful, they are except from the point of effective learning about the territory. These characteristics of a map are essential to learning whether it’s the rules of the game (climatic patterns), doctrine (universally useful approaches) or context specific gameplay. But what if my map is wrong! First, all maps are wrong, they are all approximations. What you mean to say is "What if my map is badly wrong?" Well, a map that is badly wrong can be quite dangerous. There’s a long history here of dangerous maps and poor situational awareness, books like Topographical Intelligence in the American Civil War are a worthy read. But there’s also plenty of examples of armies charging into a battle with no map and no understanding of the territory and the disastrous results that ensue - Ball’s Bluff, Little Big Horn. The difference here is that even a wrong map provides you with an opportunity to learn. Without maps, you can never learn the territory, the rules of the game, what context specific play works and what is universal. You can’t even effectively communicate with others over the territory. It’s true that maps are not the territory but if I’m going to lead a significant force against an opponent then I’d rather have a map of what we do know about the territory (even if parts of it says “here be dragons” or “we don’t know what’s in this bit”) than to charge in blindly as if everything is unknown.